Baáby [bybee] noun (plural baábies) 1. very young child: a very young child who is not yet able to walk or talk 2. unborn child: a child who is still in the womb 3. childish person: somebody regarded as childish or overly dependent told him not to be such a baby 4. youngest member: the youngest member of a family or group the baby of the team 5. immature animal: a very young animal 6. term of endearment: an affectionate term of endearment, especially for a woman (slang) (sometimes considered offensive) 7. object of affection or pride: the object of somebody’s affection, pride, or admiration (slang) That baby is ten years old and still like new. adjective smaller and younger: describes vegetables that are smaller and younger than usual baby carrots transitive verb (past and past participle baábied, present participle baábyáing, 3rd person present singular baábies) treat somebody with great care: to show a great or inordinate amount of care to something or somebody [14th century. Pet form of babe] -baábyáhood, noun throw out the baby with the bathwater to reject something in its entirety without discriminating between good and bad parts In Old English, the term for what we would now call a baby was child, and it seems only to have been from about the 11th century that child began to extend its range to the slightly more mature age that it now covers. 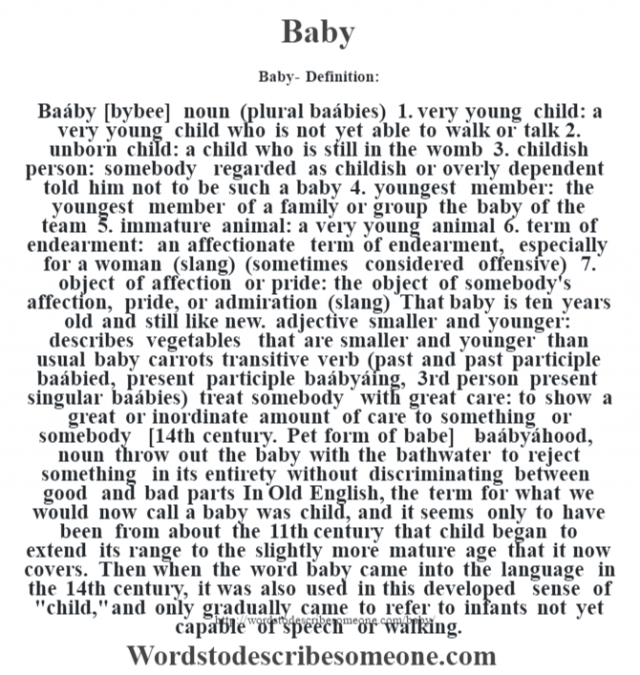 Then when the word baby came into the language in the 14th century, it was also used in this developed sense of “child,” and only gradually came to refer to infants not yet capable of speech or walking.